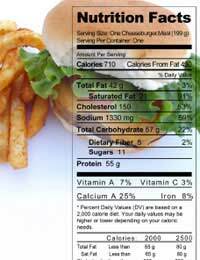 Home > Nutrition > Should Fast Food Carry a Health Warning? After calls for fast food manufacturers to start adding ‘cigarette-style’ health warnings to packaging, the industry has fought back, deciding that it wants in on the plans. As a result, fast food giants McDonald's and KFC are now involved with formulating government policy, along with PepsiCo, Kellogg's, Unilever, and Mars. The issue of health warnings on junk food has already been discussed, and the food industry came under more pressure recently after recent studies showed that the rush people get from eating foods that were high in fat and salt affected the brain chemistry in the same way as hard drugs. It’s been suggested that in future, without a warning in place, fast food and junk food firms could face legal action if it’s found that they were knowingly putting people's health at risk. The Food Standards Agency (FSA) in the UK lost their battle against the food industry in March 2010. They had been trying to force through new labelling regulations making it mandatory for food manufacturers to give a ‘traffic light’ style warning on all food labels to indicate the amounts of nutrients such as fat and sugar the food contained. Research had shown that when it comes to food labelling, the most effective warning labels are those which make use of red, amber and green logos to help people make healthier choices. Health experts had suggested that the labels should also spell out whether a product is 'high', 'medium' or 'low' in key nutrients. Will Fast Food Firms Take Responsibility? Health secretary Andrew Lansley has now joined forces with businesses to set up five ‘responsibility deal’ networks which will be co-chaired by ministers, and tasked them with generating new policies on food and health, some of which are likely to be used in a soon to be published public health white paper. Much to the dismay of some health campaigners, he has said that rather than government taking the lead on coming up with these policies, he wanted to hand the responsibility over to business, giving the manufacturers of crisps and confectionery a key role in the Change4Life campaign, the showpiece of the government’s healthy eating and fitness campaign. He has also criticised Jamie Oliver for ‘lecturing’ people about their food habits, claiming that it was not the best way to get people to change their behaviour. The groups set up by the government to look into the issues surrounding fast food and health (among other things) are dominated by members of the food and drink industry, which on the face of it does seem strange. Trying to provide some balance to the group are consumer and health groups such as Which? Cancer Research UK and the Faculty of Public Health. The food network that has been created to tackle diet and health issues includes several well-known fast food companies and processed food manufacturers, as well as Compass, the catering company responsible for the much-maligned turkey twizzler. Campaigners have criticised the idea as an alliance between big business and public health, and compared it to putting the tobacco industry in charge of smoke-free spaces. A spokesman for the Department of Health said that they had engaged a wide range of people to help with the white paper and were also including members from the voluntary sector, local government, non-governmental organisations, public health bodies and a diverse range of experts. The Faculty of Public Health said that they were hoping that the food industry would engage with them, and that this would result in changes to quality and healthiness of food. They said that as an organisation they would be keeping an open mind about the alliance until after the meetings.